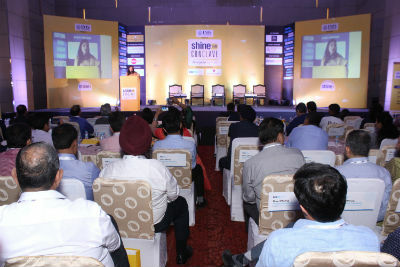 Gurgaon: Shine.com, the 2nd largest online job portal in India, successfully concluded the Gurgaon chapter of its HR Conclave recently. The event witnessed Industry stalwarts like Ratna Singh (Director HR of Flipkart), Biplob Banerjee (Executive Vice President-HR and CSR of Jubilant FoodWorks Ltd), Deepa Chadha (Chief Human Resources Officer of Vistara), Suchitra Rajendra (VP Human Resources of Pepsico) and Kinjal Choudhary (Senior Vice President and Group CHRO of Volvo-Eicher). The panelists shared their views and insights on one of the most crucial trends in the contemporary HR landscape: Man-Machine Collaboration. The panel discussion was moderated by Suchitra Rajendra, VP Human Resources of Pepsico. The conclave also had the renowned stand- up comedian, Vasu Primlani, add a melange of wit and humour, with her stand-up comedy act. The event comes at a time when there is a general fear in the market about how Artificial Intelligence can lead to job losses. The panel expressed their views on how businesses and the HR fraternity will be leveraging AI, the possible impact of AI on the existing workforce and the importance of creating a balanced workspace ecosystem to ensure maximum productivity at work. Ratna Singh, Director HR of Flipkart opined that AI could help eradicate the bias that prevails in the performance management process. The panel discussion ended with an interactive question-and-answer round. The panellists deliberated upon the significance of AI in the HR space and its usage to increase business efficiency. The discussion was interactive and witnessed a huge participation from the audience. Shine.com through the 52nd HR Conclave Shine.com wants the HR fraternity to think about the possibilities of Artificial Intelligence in establishing the right momentum between machine learning and human interventions.